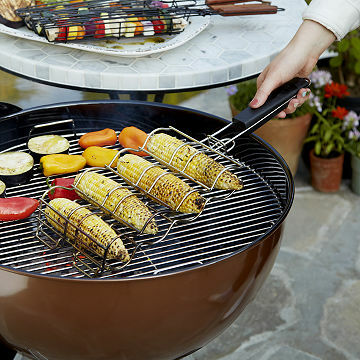 This stainless steel bbq basket gives your corn an irresistible, smoky sweetness. Use an oven mitt or gloves when handling as the handles get hot. Flexible to accommodate different-sized heads of corn, but sometimes you need to arrange which ones go in which holders so none slip out.